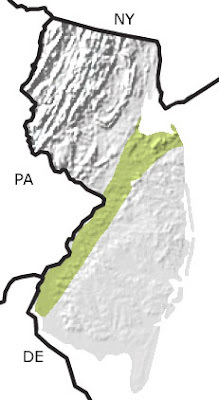 The Cretaceous formations found in New Jersey are from upper Cretaceous series. They are all from the Campanian (71-84 mya) the Maastrichtian (65-71 mya) , Turonian (89-93 mya) or the Cenomian (94-99 mya) stages. There are no known deposits of Lower Cretaceous age in New Jersey. The formations within these stages, from oldest to youngest are the Raritan, Magothy, Merchantville, Woodbury, Englishtown, Marshalltown, Wenonah, Mount Laurel, Navesink, Red Bank, Tinton, New Egypt and Basal Hornerstown. Cretaceous Fossils of New Jersey can be broken down into the following phyllums. See Cretaceous Invertebrate New Jesrsey Species for summary list of species. 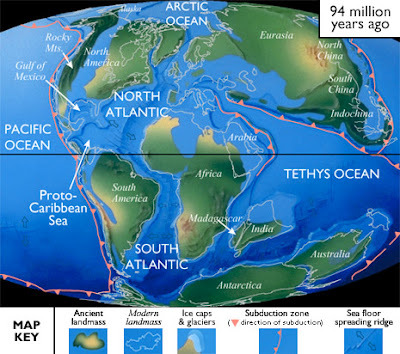 North American Paleogeography: During the Cretaceous, North America was moving northwest, closer to its present position. A large inland sea spread over much of central and southern North America. Low mountains stood out along the modern Appalachian Mountains and lowlands dominated from the modern Great Lake States into eastern Canada. Subduction along the western continental margin accelerated, adding intrusive and extrusive igneous rocks to the ancestral Sierra Nevada. The ancestral Rocky Mountains were uplifted, and exotic terrains were being added to its western margin.